An exothermic reaction is a chemical reaction which releases energy to the environment. The course of such reactions indicates the following: The starting materials have a certain energy level to which further energy is added, increasing the level. If the so-called “energy barrier” is reached, the reaction starts, the energy required being the so-called activation energy. Then, energy is released to the environment. The end products possess less energy than the starting materials as the released energy has been released to the environment (Fig. 1).Generally, much more reaction enthalpy is released than activation energy previously added. 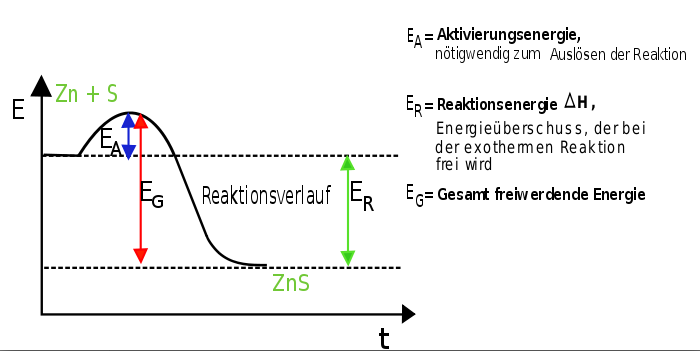 Many exothermic reactions run spontaneously: the lower the activation energy, the more likely is a spontaneous reaction. The basis of the exothermic reaction is the Goldschmidt process. It comprises the following exothermic reactions, reaching temperatures of up to 2400°C (eq. 1 and eq. 2). These reactions illustrate the basic action of exothermic risers, exothermiccovering agents, exothermic sleeves and exothermic mixtures. The standard recipe for exothermic risers typically includes aluminum, oxygen donors, fluorine carriers or – now increasingly – magnesium, fillers and binders (water glass).